Generate or export a 'Shift' report which provides statistics relating to individual shifts. Click the 'StaffMatch' tab at the top of the interface to open the 'StaffMatch' drop-down menu. 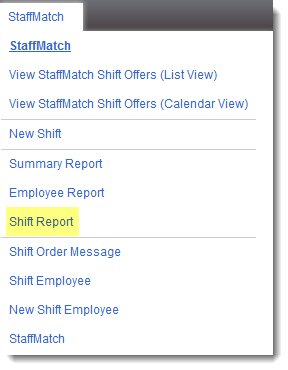 Click 'Shift Report' link to open the 'StaffMatch Shift Report' screen. Choose the search criteria to narrow your results. Search for records after (and including) this date. Search for records up to (and including) this date. If you want to view results relating to a specific customer or department, choose from the drop-down menu, or choose 'All'. Each result field indicates statistics for the selected time period. Unique ID to identify the order. Click a Shift ID number to view more details about the order. Indicates whether an order is active, inactive, or has been cancelled. Time taken to fill the shift. Number of StaffMatch orders sent. Number of employees available for shifts. Number of job offers sent to employees. Number of positions filled and confirmed. Number of job offers accepted by employees. Number of job offers declined by employees. Number of employees who reported sick. Number of employees who took leave.